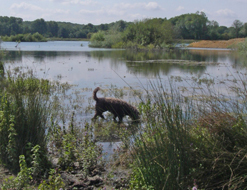 It was at 9.00 on a recent fine summer morning when Yvonne and I, with litter siblings Nénu and Odo, arrived at the gravel pits for a Water Training Day organised by the Korthals Griffon Club of Great Britain. We felt very fortunate to have been invited to participate in the day and on arrival received a warm welcome from everyone who took a great interest in our Barbets. 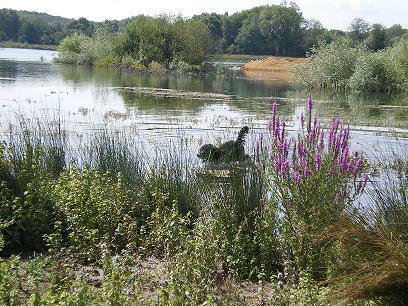 This was an ideal venue with a wide choice of water entry points and plenty of varied vegetation surrounding the water. After a welcoming briefing on the day from Allan Hender, handlers self-selected the training group to join and work began! We chose to join the novice group and although we were free to change and go to any other group at any time, we found no need to do so as the training was geared to each individual dog, and so we stayed with our excellent trainer Sue Hender throughout the day. There were 4 dogs in our group – 2 Barbets and 2 Korthals Griffons. The day was well- structured and excellent in every way. Sue began by questioning handlers about their dogs’ age, experience and standard of work and generally assessing the dogs (and probably the handlers too! ); she did a brilliant job all day devising challenging tasks without ever over-facing any dog. 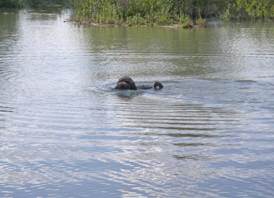 We started with short, simple marked water retrieves. There was an ideal firm gravel beach from which to enter the water which was a great advantage for those dogs that do not like a soft, muddy entry point (and this is a very common attribute in many breeds) – Nénu is definitely one of these, but she was fine on the hard shore. Odo is a tremendous worker in the water and, on being sent, entered with great speed and energy to accomplish his retrieve with great élan and much splashing! In contrast Nénu has a strong, smooth swimming style with not a splash to be seen, but she enters the water much more cautiously and definitely benefited from the firm entry. She swims like an otter once in the water and is very controlled, but Odo wins hands down in the water on enthusiasm, determination and panache! (we agreed, it’s a pity we can’t combine the two!) We progressed to longer retrieves and addressed finer details of steadiness and delivery and by the end of the morning all the dogs had made visible progress and we retreated from the heat to eat our lunch in the shade! The afternoon session started with land training; simple marked retrieves, steadiness, delivery, go-backs and unseens were all covered and individual difficulties were addressed where necessary. It was fortunate that the dogs were all still soaking wet as they were thus able to work in the heat without any adverse affect. Sue devised exercises suited to each dog’s standard; the more advanced included “lefts and rights”, the “stop whistle” and distance control which Nénu demonstrated perfectly (though I say it myself!) Odo learnt the go-back command which he had not done before and again, all the dogs made obvious progress. We then returned to the water, but to a very different soft and muddy entry point! This did not deter Odo at all who maintained his morning enthusiasm, but Nénu was, as I expected, hesitant to begin with, however Sue produced a small squeaky ball which Nénu found very intriguing (she’s never had a squeaky toy as I can’t abide them!) and she was quickly through the mud and into the water to investigate it. To end the day we returned to the clean stony beach to wash the mud off and to let the dogs have some free swimming. Odo also got a lesson in the “over” command; this is used when requiring the dog to negotiate an obstacle e.g. fence, ditch or stretch of water, on the way to a retrieve. His determination to hunt out a dummy on a gravel bank across a short stretch of water was admirable! Nénu has already learnt this command as she goes regularly to gundog training, but it was new to Odo and he did well. By the end of the day we were very hot (not the dogs … they were wet so lovely and cool) and very tired but with renewed determination to continue improving our dogs’ working skills when we were home again. It was very interesting and enjoyable to learn by watching different dogs and breeds working and I know we all benefited greatly from the mutual encouragement and support of the group. Once again, Yvonne and I would like to thank the Korthals Griffon Club of Great Britain for so kindly inviting us to join them for the day and our special thanks go to Sue Hender, our trainer. We look forward to training with Korthals Griffons again soon. PS: this training lasted 2 hours in the morning and a very long afternoon! Odo got to retrieve what a Griffon Korthals didn't..! When all was said and done, a great day! A very big difference with how dogs train in the UK and in France.That's coming up, too! Stay tuned!